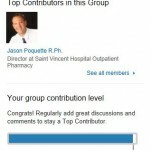 LinkedIn is arguably the most important professional social media resource for pharmacists. Personally, though I am most active on my TWITTER account, and though I obviously am a big fan of blogging and writing, I am convinced that no social media resource is more important to your professional career as a pharmacist as LinkedIn. You need to be there. LinkedIn was launched in May of 2003 and currently has over 275 million users worldwide. It is the 3rd most popular online social website behind Facebook and Twitter. About 40% of LinkedIn users check this site daily. LinkedIn is far more than simply a location to post the internet version of your resume. LinkedIn is THE central place for your most important professional connections and conversations. It might be not be an exaggeration to call it the “sun” of your professional solar system. At a time when the job market for pharmacists is extremely competitive, we have to recognize that the “old school” way of finding a job is extinct. Gone are the days when you simply turned over your home-made resume to a human resource manager and expected an interview shortly. Today most jobs, 80% to be exact, are landed through networking. I have written on networking for pharmacists before. But this article is specifically about how to get involved in and utilize LinkedIn as a career resource for pharmacists. I have been a LinkedIn user for many years. I personally have well over 1,000 great contacts and connections with other pharmacy-related professionals on this site. I’m always looking to grow my network with other professionals who share similar interests, people whom I might be able to help with my experience and people who might be able to help me. 1) Join LinkedIn & setup your account. The first step is simply to join. LinkedIn is FREE. And if you don’t already have a LinkedIn account it is a very simple and quick process to create one. You will need to have an email address and you will need to create a password. Other than that, it is pretty simple. Once you have joined you need to begin filling in your career picture. Fill in your current job, along with your previous jobs and the dates you worked at those companies. Include any honors, awards, certifications and skills. Your education & interests should also be completed. But won’t my employer think I’m looking for a job if I join LinkedIn? Probably not. LinkedIn isn’t simply a site for job-seekers, though it may helpful in that way. Your employer probably has a LinkedIn page for their company. Joining LinkedIn and following your company page is actually a way to show commitment to your present job. 2) Have a professional photograph taken. Your LinkedIn account should be, in my opinion, your BEST presentation of yourself. So skip the fun picture of yourself at uncle Fred’s last birthday bash and resist the temptation to show off your outdoors/vacation adventures. This is your professional image, and your photo should reflect what your next employer should expect. So do it right. For $75 – $100 you can have a professional photographer take a bunch of head/shoulder shots of you in your nicest outfit (suit coat or nice shirt and ties for the men). Make SURE that whomever you get to do this will provide you with the image files and that you own the rights to use them however you want. If you have someone else take the photo, just make sure it is done well. First impressions matter, and this may be the first impression you make with many new contacts. Upload the best photo to be your image on LinkedIn. Once you have your account fully completed, and a professional photo uploaded, begin to build connections. That is what LinkedIn is all about. Start by searching for people you have known and worked with. Send them connection requests. NOTE: you can search for people through the search box at the top of the page. Click on “connect” to send them a connection request. BUT – I suggest you always put in a brief personal note in addition to the generic “I’d like to add you to my professional network on LinkedIn” message. Once you start adding people you know, LinkedIn will suggest OTHER people (typically people in THEIR network) that you may want to connect with too. Look at their job description. Is it in a similar field to yours? Would you like to have them in your network? You don’t have to want to become their best friend. LinkedIn is okay with such connections, but you just have to be sure NOT to overdo it. Sending out lots of connection requests all at once to people you don’t know could get your account temporarily suspended. Next you need to join some groups. This is where the networking can really begin to blossom. Under the “interests” tab on your profile you will notice a drop down option for “groups.” You can search for groups in your area of interest. I recommend joining both large and small groups related to your area of professional interest. 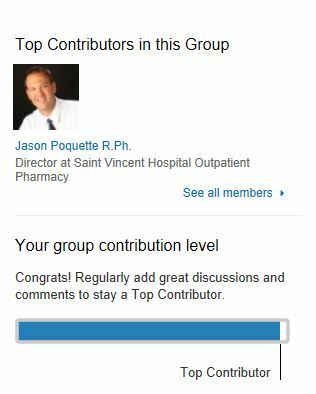 For example, you will want to join the group called “Pharmacists.” This group has over 25,000 members. I’m also a member of the “Massachusetts Pharmacists Association” group which has only about 500 members. There are thousands of groups to join. They don’t all have to be pharmacy-related. Once you have joined some groups, start to make comments and contribute information to the discussions that are posted. It is VERY important that you remember that everything you say can be read by others, including potential employers, prospects, co-workers and clients. Keep it professional. Keep it cool. If you come off as a hot-headed, closed minded, argumentative person on LinkedIn…don’t be surprised if you discover this hurts you down the line. But on the other hand, making helpful and meaningful contributions, ESPECIALLY complimentary comments about what others have said, will go a LONG WAY in boosting your professional image. Feel free to connect with me once you have created you account.